… and it’s rewiring sharks brains. It’s no secret that climate change is changing how species behave and their movement patterns, but new research out of The Fish Lab at Macquarie University shows that it’s changing how their brains are wired too. In the study, which is the first of its kind on elasmobranchs, the researchers showed that juvenile Port Jackson sharks exposed to the elevated water temperatures expected at the end of the century showed strong preference to turn right when given a Y-shaped choice experiment, compared to those reared in present water temperatures. This group showed no strong preference for either the right or the left. This indicates that under warmer conditions, Port Jackson sharks seem to develop strong behavioural laterality, where they currently don’t show any behavioural laterality. ‘Behavioural laterality’ is the tendency for an animal to favour the left or right in a given situation, such as which hand you write with or which way you go around an obstacle. It is the brains way of automating certain behaviours in order to ‘free-up’ mental energy which can then be used for more complex tasks. An adult Port Jackson shark in a crevice. Image by The Fish Lab. So the sharks are right handed (well.. uh finned..). So what? Water temperatures predicted for the end of the century have been shown to impair development and alter important survival behaviours in many fish species. Changes in behavioural lateralisation specifically may be an indication of impacts on brain development and brain function. The authors propose that “enhanced lateralisation could help animals cope with the deleterious effects of climate change on development and growth.” In other words, the brain may be creating these shortcuts to help cope with the negative effects climate change may be having on the body and brain of the sharks during critical developmental stages. "Elevated temperature significantly increased developmental rates and metabolism, with associated costs in terms of energy allocation to growth and physiological processes," the author’s noted. "Therefore, stronger lateralisation may arise as an energy-saving mechanism." This study, being the first of its kind to look at sharks, only scratches the surface of the potential effects of warming waters on the brains of elasmobranchs. The authors note that far more research is needed before we can truly begin to understand the consequences of global warming on our fishy friends. 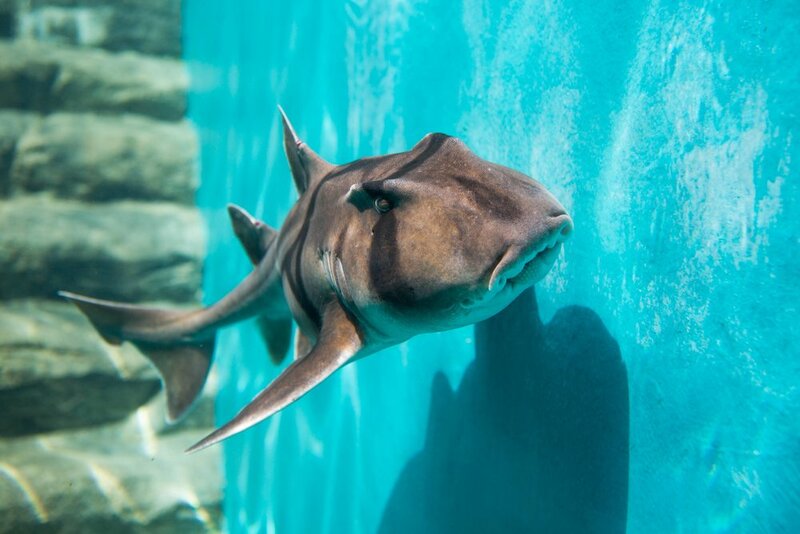 If you’d like to learn more about Port Jackson sharks, check out our latest Species Spotlight which is all about these charismatic sea puppies. An adult Port Jackson shark. Image by Julianna Kadar.